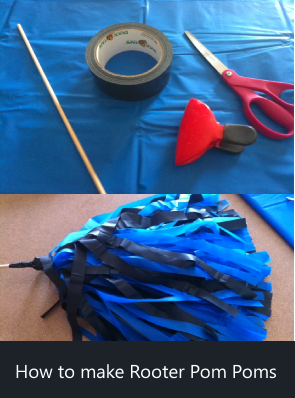 We've discovered a great way to make Rooter pom poms that is quick, easy and inexpensive! Use these great pom poms as a decoration for your next cheerleader or football themed party, as a fun craft or activity, for a parade themed party ... the uses are endless! Make them for sporting events, parades, or football games! They are made from plastic tablecloths that you can find at the dollar store. All you need is some tablecloths, scissors, small dowel sticks, a large clip and duct tape. Enjoy! The video will take you through how to make them step by step. Send us pictures of the rooter poms you've made for your party or event and we will add them to this page for others to get ideas from!